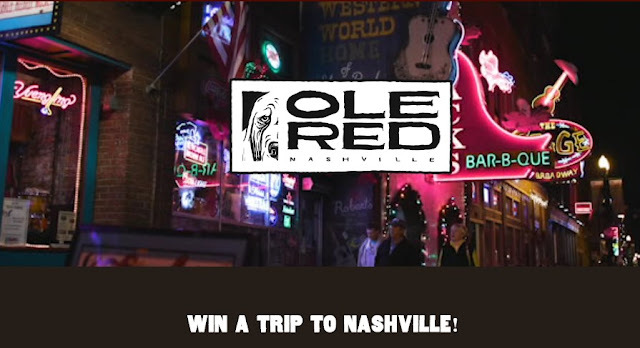 Nashvilles' Ole Red will reopen in 2018 and they're celebrating by giving you a chance to enter to win a VIP Trip to Nashville to check it out and see The Grand Ole Opry! Grand Prize includes: VIP experience at Ole Red including dinner followed by dessert on The Roof; Round trip domestic air travel for winner and one (1) guest to Nashville International Airport (“BNA”), subject to Air Travel Restrictions below; Double accommodations for two (2) consecutive nights in one (1) room for two (2) people at a Nashville hotel (dates TBD); Two (2) tickets to each of: Grand Ole Opry on TBD date, and Grand Ole Opry House daytime tour; Two (2) tickets to tour the Ryman Auditorium Approximate retail value of prize is $1,500. HINT: Scroll about half way down the page to find the spot to enter this sweepstakes. This Sweepstakes ends on 12/14/17 and you can ENTER ONCE to win.